Rio Grande’s Dylan Shockley obtains a hit during the RedStorm’s series against Cincinnati Christian. After going just 1-6 in its previous seven River States Conference contests, the University of Rio Grande baseball team saw its post-season hopes thrown into jeopardy. But the RedStorm put the brakes on their recent skid in an authoritative manner against Cincinnati Christian University. Rio Grande improved to 19-23 overall and 11-9 in the RSC with the sweep. The RedStorm also remained tied for fourth place in the RSC standings with Indiana University-Kokomo, which swept a doubleheader from WVU-Tech on Friday. The top six teams will qualify for the conference tournament, which begins May 3 at VA Memorial Stadium in Chillicothe, Ohio. Senior Cody Blackburn and junior Michael Rodriguez had run-scoring singles in the first inning and senior Kameron Herring added a solo home run in the fourth inning of the opening game, but it was the nine-run fifth inning which blew things open. Sophomore Eli Daniels had a pair of run-scoring singles and drove in three runs in the inning, while senior Juan Cruz had an RBI double, senior Ty Warnimont had a sacrifice fly and junior David Rodriguez and Blackburn both had RBI singles. Sophomore Dylan Shockley had a pair of doubles in the winning effort, while Michael Rodriguez finished 2-for-4 with a double and David Rodriguez also had a double. Senior Zach Harvey allowed two hits and a walk while striking out five over six shutout innings. Payton Jenkins started and took the loss for CCU, allowing 12 hits and 12 runs – eight earned – over 4-2/3 innings. In game two, David Rodriguez hit a two-run first inning home run, while Herring had a solo home run and Shockley added a two-run homer in the pivotal five-run second. Shockley finished 3-for-4 with three RBI, while Cruz also had three hits and drove in a run. David Rodriguez, Daniels and Michael Rodriguez all had two hits each in the victory and freshman Kyle Boggs drove in two runs. Senior Osvaldo Duran allowed two hits and two walks over six shutout innings en route to the win. The right-hander also struck out five. Sam Wood started and took the loss for the Eagles, allowing six hits and three walks – along with seven runs – over 1-1/3 innings. Bradley Brown doubled in a losing cause for the Eagles. Michael Rodriguez hit a three-run first inning home run and Cody Blackburn added a three-run walk-off home run in the seventh inning to punctuate the RedStorm’s 16-4 mercy rule-shortened victory at Bob Evans Field. Rio Grande improved to 20-23 overall and 12-9 in the RSC with the victory. Cincinnati Christian dropped to 7-26 overall and 5-15 in league play with the loss. Rodriguez, a junior from Santo Domingo, D.R., capped the RedStorm’s four-run first inning with his second home run of the season, while sophomore Eli Daniels had a sacrifice fly as part of a two-run second inning which gave Rio a 6-0 lead. The Eagles showed signs of life by scoring four times in the third inning, but the RedStorm exploded for seven runs in the fifth and then invoked the 10-run mercy rule thanks to the seventh inning home run by Blackburn. Senior Kameron Herring had three hits, including a double, and drove in a run for Rio Grande, while sophomore Dylan Shockley and senior Juan Cruz both had two hits. Shockley had a double and also drove in a run. Blackburn finished with four RBI, while senior Ty Warnimont scored four times and junior Matt Joyce scored three runs. Junior Dalton Wilburn earned his fifth win in seven decisions, allowing 10 hits and four runs over six innings while walking two and striking out eight. Jared Seibert started and took the loss for CCU, allowing two hits and issuing six of the Eagles’ nine walks over two innings. Seibert, Micah McCrary, Cesar Bernal and James Cathey all had two hits and Zach Bobbitt had a two-run double in the loss for the Eagles. 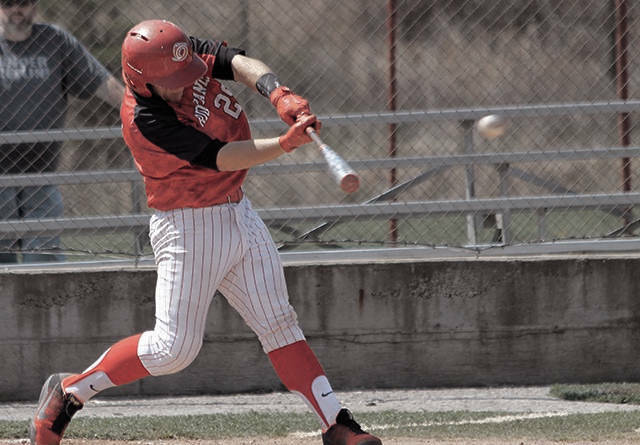 Rio Grande returned to action on Tuesday when it traveled to NCAA Division I Northern Kentucky University for a single nine-inning contest.